I run an outpatient antimicrobial therapy (OPAT) service in the Grampian region of north east Scotland, caring for patients with serious skin and soft tissue infections. In such a large geographical area, one of the main challenges is the long distances people have to travel to reach hospital; it can be a 100-mile round trip for some. These patients are most likely to be frail older people who don’t have easy access to transport, or young people who need to fit hospital appointments around work or school. Some are classed as obese and are self-conscious about travelling on public transport and unable to walk long distances as they get tired very quickly. Some are homeless or are using intravenous drugs. These are patients we would generally have to admit because they do not fit the strict criteria of the OPAT service, which requires them to be able to attend daily for IV therapy. We have seen older patients become confused while in hospital, leaving them at higher risk of falling, while younger patients can lose their income, or school time, while being in hospital. There is also the risk of patients absconding with IV access in place, or misusing the IV access. 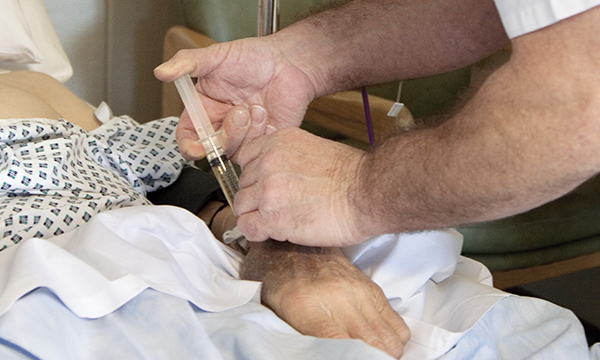 Problems with IV access can lead to patients missing doses of antibiotics, and the deterioration of veins. An added pressure is the availability of hospital beds, which is only getting worse. This increases stress on the already short-staffed wards and adds to the workload of the nurses carrying out the care. We are constantly being told there is no money for more staff and the budgets are stretched, so we have had to be creative about making things better for our patients and our nurses. Fortunately, we now have antimicrobials that can be given as a one-off dose during an outpatient appointment, and that stay in the body for up to 14 days, as well as other antibiotics that can be given every three days to save patients having to attend hospital daily. This means we have been able to adapt our services to treat the patients who are not normally suitable for OPAT by giving them longer-lasting antimicrobials as outpatients. By doing this, we can improve their care and outcomes. Patients no longer need to be admitted but are seen in clinic by the OPAT nurse, where short-term IV access is gained, bloods can be obtained, and they are given the prescribed dose of antimicrobial. Then the IV access is removed. This helps preserve the veins as we don’t need to do multiple IV punctures. It also means patients don’t need to be admitted, relieving pressure on nurses on the wards. We have had to become inventive in how we follow up these patients. For some, it’s a weekly telephone conversation; the patient might then go to their GP for follow-up bloods. For patients in nursing homes, the GP will go to them and repeat the bloods; we then have a telephone consultation with the nursing home staff. Some patients return to the clinic for a top-up of antibiotic, but it means they don’t have to stay in a hospital bed overnight, and they can maintain as normal a routine as possible. I see up to 140 patients a year who benefit from these changes, saving 4,307 hospital bed days. It is always worth thinking about areas of your practice where you are stretched. Is there a small change you can introduce to make things a little easier for your patients and your staff? As nurses and providers, we should be willing to adapt our services to fit around our patients, rather than expect them to fit around us.